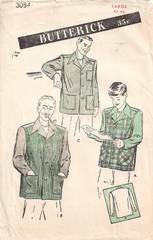 Vintage Butterick sewing pattern 3084 for men's sport jacket with optional contrast front. The pattern pieces do not have printing on them and are precut and perforated for identification. The pattern is complete. The pieces do not appear to have been used but there is one clean tear - several inches long - on one of the sleeve pieces. The envelope has several small mends on the edges neatly done with archival tissue tape.